Ayesha Tak, Dinesh Bharti, Prena Rathord, Punita Chouhan, Urmila Rathore. Started first introduction from Eenakshi. Then each one of us introduced ourselves. After that following conversation took place. PRD : How is the weather in Canada? PRD : Here the temperature is 45°C. It is very hot and difficult to come out during day time. E : What do you teach ABCD in Nursery Class? ATK : By showing picture and chart and saying it aloud. The students lepeat It. E : What is your husband doing ? ATK : He works in a shop. DBI : How can we apply for Canada visa ? E : You can apply for visit visa. DBI : Any other way to get visa ? E : It depends on education and reason for which they have vancancy. PCN : What is your favourite subject ? E : My favourite subject is English . PCN : How many kids do you have ? E : I have two sons – Ray and Ralph. Then we spoke to her sons Ray’s favourite sport is ftball. He likes his visit to India. They both spoke nicely. Then we all sang the song “ I have a dream”. She said you have learnt the song and sang nicely. PRD: Did the song remind you of your childhood days? E: Yes it is my favourite song. OK, Bye, nice talking to you. All said goodbye and the conversation ended. Thursday, 21st May: Yesterday Group one and two had their conversation, while today Group three and four had their Skype talk. The teachers in Group three were Mr. Ajay Vijayvargi, Ms. Kusum Sharma, Mr. Surendra Singh, Ms. Rajeshwari Rathore, Mr. Kanik Goyal, Ms. Anuradha Rajpurohit and Ms. Bharti Sharma. Admission for Indian students is difficult as they do not recognize Indian degrees. Students have to clear Entrance Exam. Studies are costly as Non-Canadian students are supposed to pay four times the fees. Indian recipies like pickles, peppers, spices etc., are available at Surray. Temperature in Canada was 21°C and it was very hot for them. Eenakshi had visited India last December to attend her relative’s marriage. She visited India once in five years as to and fro plane fares are very high. Group four also had a conversation with Eenakshi. 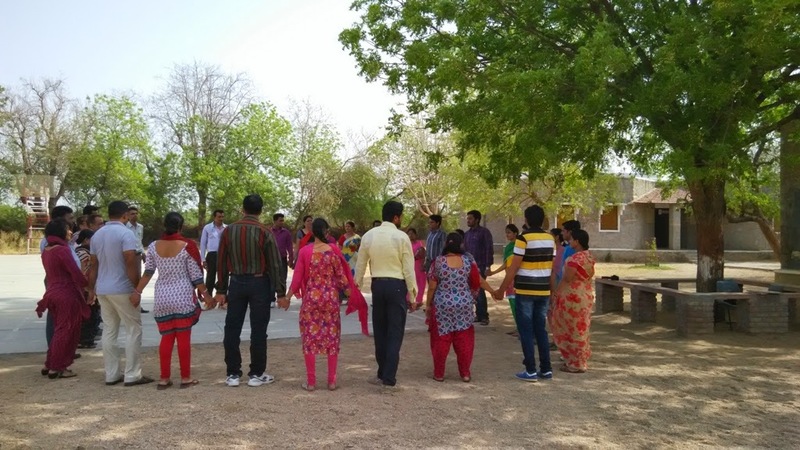 The teachers in the group were Ms. Sharmila Vijaywargi, Ms. Raj Ranawat, Ms. Bharti Rao, Mr. Krishan Gopal Dave, Mr. Tarun Mishra, Mr. Prakash Dangi and Mr. Usman Gani. First of all Sharmila asked about her daughter’s subject selection. Eenakshi replied that if she would like to come to Canada, then she would have to study Canada law. She asked where she was from? Sharmila replied that she was from Ajmer and her in- laws were from Indore. Sharmila said that she had done her schooling from Demonstration School and college from Sophia. Eenakshi also replied that she also did her graduation from Sophia College ,Ajmer. Usman introduced himself. Eenakshi asked him about his qualifications. Usman replied that he had done MCSE and CCNA. Then she invited him to come to Canada. On which Usman replied that if he gets a chance he will surely come. So Eenakshi said, “ Lets hope for the best”. After K.G.Dave introduced himself Eenakshi asked him from how many years he was teaching in the school. Mr. Dave answered that he was teaching in the school for last eight years and he had a teaching experience of thirteen years. Eenakshi asked him to speak in Hindi, but he conversed in English only. She asked him which classes did he teach? To which he said that he taught Classes IX to XII. Eenakshi asked if Sanskrit was taught in the school. Mr. Dave replied that Sanskrit was taught as a third language in the School to Class VI-VIII. Prakash Dangi had a conversation with Eenakshi. She asked him about his qualification and her husband asked him about instruments. He replied that he was M.A. in Indian Classical Music and told about his instrumental music. EX: I am fine . Where are you from? TM: I am from Indore. E: What have you done? BR: Hello! Eenakshi. I am Bharti. How are you? EX: I am fine. Where have you done your schooling from? BR: I have done my schooling from Sophia High School, Mount Abu. EX: I was teaching there in 1988. When did you pass out? BR: I passed out in 1986. EX: Do you know Ms. Agarwal and Ms. Santosh Sharma? Were they there when you were studying? Tell me about them if you know them. BR: Yes both of them taught me. They were my neighbours. Nowadays Ms. Agarwal is in Dehradun . Her daughters have got married and are in New Delhi & Gurgoan. Ms. Santosh is in Mount Abu. She has retired , her daughter is in New Jersey and son is in Mumbai. EX: Who was your Principal then? BR: My Principal at that time was Sister Jovita. Who was your Principal? EX: At that time Sister Fleurette was the Principal then. Do you know her? BR: Yes I know her. Where is she now? EX: She is in Kota. BR: Thank You Ma’am. It was wonderful talking to you. EX : Fine and you are. RR: I am also fine. EX: What do you teach in school?. RR: XI and XII standard. EX: How long have you been in this school? EX: Girls and boys both are in class. EX: What have you done?. RR: I have done M.SC. in 2004. RR: Yes! I have done B.ED. in 2008 from Udaipur. Then the group had a conversation with Eenakshi’s son Ray. All: Hello! What is your name? Ray: I am Ray. Hello all of you. TM: Do you like to play? TM: In which place do you play in the game? Ray: I just play, not on any definite position. Raj: Which part of Chemistry do you like most? Ray did not answer, he just laughed. The group bid him and his mother Goodbye and goodnight. Group Five has yet to have a Skype talk. May be next week.